LOW I’m terrible at music puzzles. I hate ‘em! WTF What’s the deal with the huge gap of time between episodes? It’s been a long time since the last episode, but the newest installment of King’s Quest is finally here. Titled Once Upon A Climb, this chapter tells the story of how King Graham met his queen, and the adventure that led up to it. As the chapter begins, Graham has finally gotten the hang of running Daventry, but he’s feeling empty and unfulfilled. Naturally, as a young man in shockingly good shape, his thoughts turn towards more than declarations and treaties. His magic mirror reveals that he will meet his true love at the top of a far-away tower, so he sets off immediately. Upon arriving (and promptly getting trapped inside), he finds that there are actually two princesses within the spire’s confines. What to do? 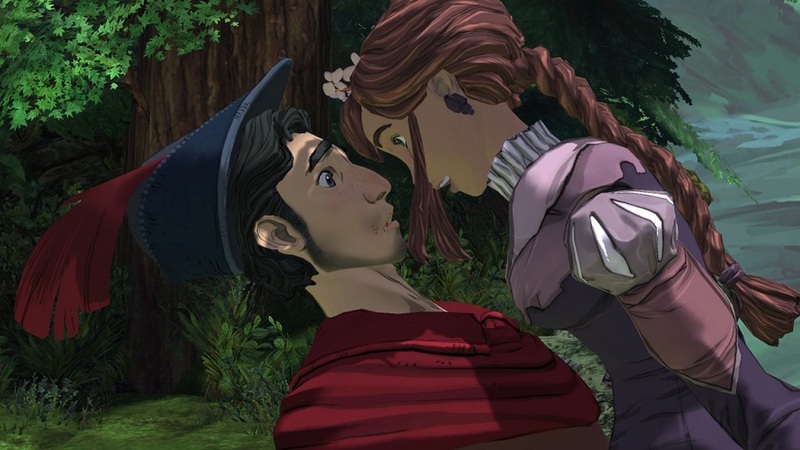 Although I was absolutely in love with the first two episodes of King’s Quest, I have to admit that I’m feeling a little split on this one. On the one hand, the artwork is consistently fantastic, the voice work is top-notch, the story is often quite funny and the whole thing is just impossibly charming. The Odd Gentlemen nail the sweet spot for production and aesthetics yet again, and I find that I have a great deal of affection for these characters and the series thus far. On the other hand, Once Upon A Climb is the most unsatisfying installment of the three currently available. My first issue is that it’s been a whopping four months since the last chapter, and that’s way too long to wait for a game being released episodically. So much time had passed that I forgot the specifics of what had come before in the plot, and there’s not much of a recap. Losing so much momentum in the narrative hurts. Momentum in the gameplay was lost as well. Since it had been so long since part two, I forgot the intricacies of how the player needs to interact with the world. For example, I got stuck on the first few puzzles because Graham appeared to be on a 2D plane when it was actually 3D, or because I wasn’t recognizing things I could interact with. It didn’t take long to re-learn the ropes, but it was a factor. The other thing that brings Once Upon A Climb down is that not only is it the shortest episode, it also feels rushed. Once I shook the rust off and got back in the Quest groove, I found that all the puzzles were incredibly simple, and some weren’t even puzzles at all, being more like QTE-style time-fillers. Worse, some of these challenges are repeated over the course of an episode that’s only about three hours long. There also aren’t very many locations, and both Graham’s romance and the ultimate resolution didn’t have much emotional weight because I just didn’t spend enough time with them. Nothing here is bad, but the developers have already shown us what they’re capable of, and Climb doesn’t feel like their best. My gut feeling is that this episode was launched before it was ready—the bones of story and gameplay are pretty bare. Disclosures: This game was obtained via publisher and reviewed on the PS4. Approximately 3 hours of play were devoted to the single-player mode, and the content was completed. There are no multiplayer modes. Parents: According to the ESRB, this game contains: fantasy violence. This game is utterly safe. The most violent thing that happens is when the player shoots goblins with arrows, but it’s totally bloodless. Graham generally tries to solve all solutions nonviolently, there’s no salty language and no sexual content. It’s perfect for kids. Deaf & Hard of Hearing: All dialogue offers subtitles, but D/HH players should know that there is another music-based puzzle. There are some small visual cues, but it’s next-to-impossible to solve it without being able to hear, and even with hearing, it requires a good ear and good memory. A FAQ will be needed to get past it. The archery section is also quite tough to follow without being able to hear, since reading the subtitles takes the player’s eyes off of the action.